British astrobiologists are claiming to have found alien life form in the Earth’s stratosphere. They collected a small diatom frustule that could have come from space after sending a balloon to 27 km into the stratosphere during the recent Perseid meteor shower. This image shows a diatom frustule, possibly a Nitzschia species, captured on a stud from a height of 25 km in the stratosphere. Image credit: Milton Wainwright et al. The balloon was launched near Chester, UK, and carried microscope studs which were only exposed to the atmosphere when the balloon reached heights of between 22 and 27 km. The balloon landed safely and intact near Wakefield, UK. 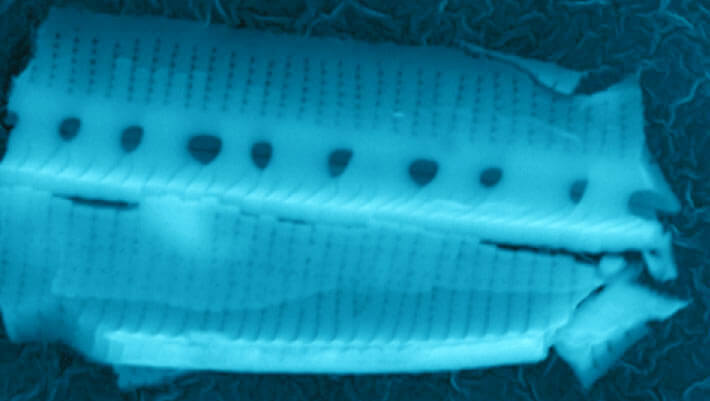 The scientists then discovered that they had captured a diatom fragment and some unusual biological entities from the stratosphere, all of which are too large to have come from Earth. The team is hoping to extend and confirm their results by carrying out the test again in October 2013 to coincide with the upcoming Haley’s Comet-associated meteorite shower when there will be large amounts of cosmic dust. It is hoped that more new, or unusual, organisms will be found. “Of course it will be argued that there must be an, as yet, unknown mechanism for transferring large particles from Earth to the high stratosphere, but we stand by our conclusions. The absolutely crucial experiment will come when we do what is called ‘isotope fractionation’. We will take some of the samples which we have isolated from the stratosphere and introduce them into a complex machine – a button will be pressed. If the ratio of certain isotopes gives one number then our organisms are from Earth, if it gives another, then they are from space. The tension will obviously be almost impossible to live with!” Prof Wainwright said.